Document Summary: An introduction to BSP Brushes, including creation and modification tools. Includes links to relevant documents. Excellent for beginners. Document Changelog: Last updated by Michiel Hendriks. Previously updated by Tom Lin (DemiurgeStudios? ), for document summary. Original author was Tony Garcia (UdnStaff). One should note that the term BSP (Binary Space Partitioning) is a data structure that is used to organize objects within a space of the level and not semantically the correct term for a type of geometry. CSG (Constructive Solid Geometry) is a more accurate term for the geometry created within the unreal engine by adding and subtracting brushes, but BSP has become the terminology to describe this geometry and it's stuck like a bad nickname. That being said, just keep in mind that the terms BSP and CSG are often used interchangeably to refer to the geometry created within the editor using brushes. BSP Brushes are the basic building blocks of a level. You can build a level with almost no BSP brushes, but you still have to have at least one BSP brush to "cut out" where the world is. You have to think of the "void" as a solid and then subtract out an area where the world exists. You subtract out this area with a BSP brush. Subtractive - Used to carve out spaces where the level exists. Soild -- used for any thing that will fill up a space. Antiportal Volumes - used for occluding all geometry types within the level. You create the BSP brushes by selecting your primitive, setting the size by right clicking the icon and plugging in numbers. Then use the CSG buttons to add or subtract the brush. 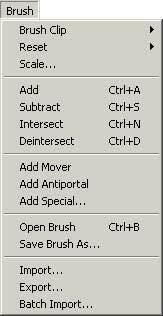 You can Use the Add Special Button to add non-solid brushes (used for zone portals mainly). The "Add Antiportal" button creates a non-solid brush that occludes geometry from the renderer. Once created from a brush, it cannot be modified. For more detailed information see the LevelOptimization document. You can modify your BSP brush several ways. You can re-shape it and scale it, move the vertices around, clip the brush, etc... to manipulate the brush to just the shape you need. You can access the modes to modify your brush a couple different ways. One is to go to the Menu at the top and go to Brush, and select your method from the menu. Also, you can select the mode from the tool bar. And you can right-click the brush to get a menu to choose from. You can also access the Brush Properties (and some other useful functions) from here. You can select vertex editing mode from the tool bar, or you can simply click a vertex and hold CTRL while moving the vertex. More information on vertex editing can be found here in the VertexEditing document. You can scale your brush by clicking the brush scale icon on the tool bar. If you hold CTRL-LMB while moving the mouse you will scale your brush. You can also scale the brush by going to the top menu, going to Brush and selecting Scale. This will open a Brush Scaling dialog box. Here you can plug numbers into the different axes to get the size you want. For example if I had a 256 cubic brush and I wanted it to be twice as tall (512), but the same length and width I would put a 2 in the Z axis box and leave the others at one. You can rotate the brush in Brush Rotate mode or by holding CTRL and moving the mouse in the different 2D views. You can clip brushes by clicking the Brush Clipping button on the tool bar. Specifics on brush clipping can be found in the BrushClipping document. Accessed through right-clicking the brush, there are several functions here. I will not duplicate anything here that you can read elsewhere but I will outline the functions that are accessed through this menu. Move to Origin - Moves the brush back to the center of the map with it's pivot point at the 0,0,0 coordinate. Reset Rotation - If you have rotated your brush and want it back to its original rotation use this. Reset Scaling - IF you have resized or scaled your brush this will set it back to it's original size. Reset All - This will reset both the scaling and rotation of the brush, as well as move it back to it's origin. Location/Rotation from Camera - This sets the orientation and position to align the camera of the active window. Mirroring - mirrors the brush on the given axis. Transform Permanently - when you scale or rotate the brush the editor will "know" this (that's why you can reset) so transforming permanently will make your scale/rotation permanent on the brush. Also, when vertex editing you will sometimes get a brush that will disappear from view when you zoom in on it. Transforming permanently will fix that. You can merge or separate the polygons of a brush here. If you have a face that has been split and you want to reduce it to one poly use this. The faces must be coplanar, with the same texture and aligned the same for this to work. You can reverse this by separating them. You can change a brush from a solid to a non-solid. Semi-solids are obsolete. Use this to set or reset the position of the pivot point. Additive - changes brush to an added brush. Subtractive - changes brush to a subtracted brush. To Static Mesh - Converts the selected geometry into a static mesh. To Brush - Creates a brush in the form of the selected geometry. Snap to Floor - Moves geometry to the base of the base of the BSP zone that it is within. Align to Floor - Aligns to the orientation of the BSP zone that it is within. You can probably tell by all the options that BSP Brushes were once the MAIN building block of a level. New technology (terrain and static meshes mostly) have pushed BSP brushes into the back seat. BSP Brushes are now mainly used for setting up zones and the larger playing space for your level while terrain and static meshes are used to create the majority of the geometry in your world.